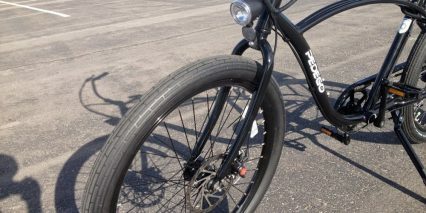 Schwalbe Fat Frank, 26" x 2.35"
The Interceptor is Pedego’s work horse. 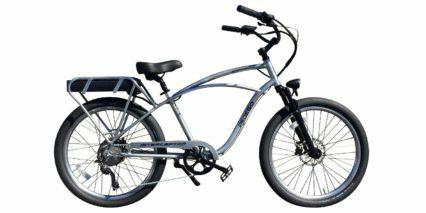 It’s large, powerful and sturdy and up until this second revision (known informally as the Interceptor II) it hasn’t really differed from the 48 volt version of the Classic Cruiser. Same frame, same drive system configuration… just a stronger power source. 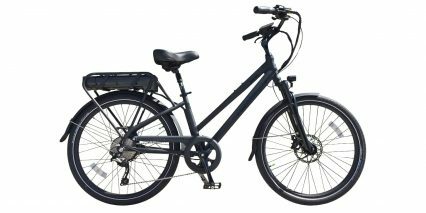 All of that changed in 2014 when the Interceptor adopted the controller and pedelec sensor that were introduced with the City Commuter. The new Pedego Interceptor offers the versatility of twist throttle and pedal assist mode with the ride quality of a relaxed cruiser. 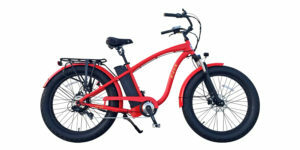 Driving this ebike is a powerful 500 watt geared rear hub motor. The older Interceptor ran a gearless design which was a bit quieter but much larger and heavier. Given the geared nature of this new motor, there are more parts to rub and wear over time but in reality it should hold up fine. It’s the same motor that drives the City Commuter which has been out for nearly two years and had very few, if any, complaints. So it’s lighter, smaller, still provides great torque and provides space for a seven speed Shimano Acera cassette. 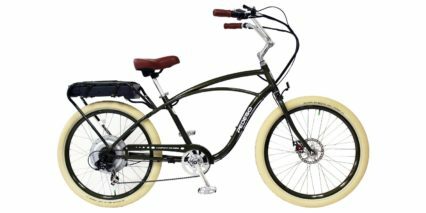 The gears on this bike shift smoothly using a twist grip style shifter mounted on the left handle bar and seven speeds is a decent range that provides leverage for climbing hills or pedaling at speeds in excess of 20 miles per hour. 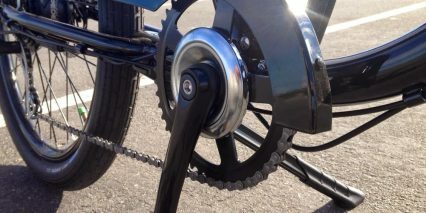 A matching chain guard keeps pants from getting snagged or greasy on the chain and I love the new silver circlet positioned in the center of the front chain ring. I assume it’s just for decoration but it also conceals the pedelec sensor (possibly protecting it from dirt and water when riding). As with other Pedego bikes, the pedals are made from solid aluminum, providing a wide surface area with plenty of grip. The LCD controller allows you to easily switch from twist throttle mode to one of five pedal assist levels and see your speed, distance traveled and remaining battery capacity. A few other changes with this iteration of Interceptor are the rear rack, pedal position and kickstand. 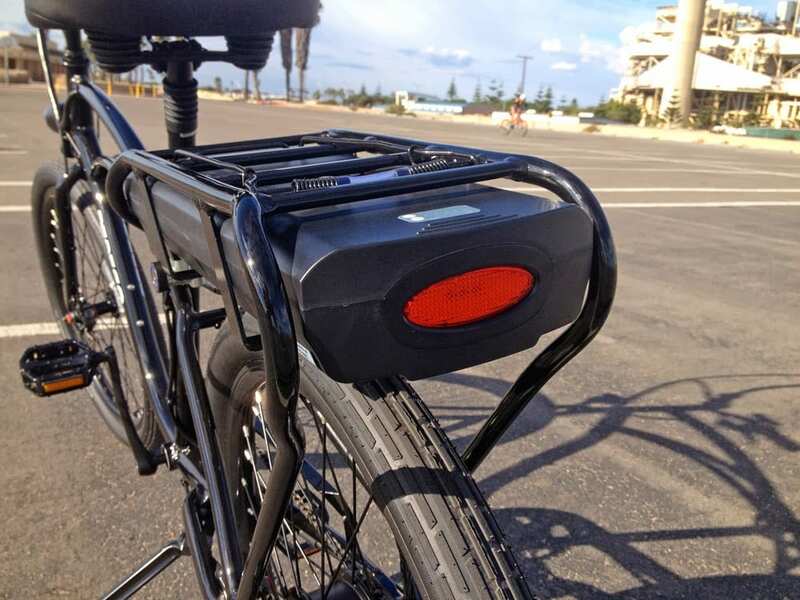 Firstly, the rack and battery pack have been reinforced and improved with a built in light. It’s not the world’s brightest but it does run off the main battery (as well as the front light) and can be activated by pressing a button on the battery pack itself. 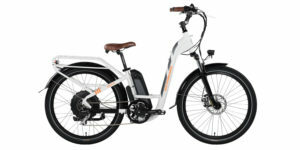 Unlike some of the other new European ebikes, the light is not connected to a dynamo for use if the battery does get drained. That would be nice to see on future iterations and it may be that the more lax regulations in the US do not require it as a standard feature. Secondly, the bottom bracket on the Interceptor and other cruisers from Pedego (and other brands) has been pulled back to align with the seat post tube. This was done to honor Electra’s “Flat Foot” patent. The idea being that pedals which are positioned further forward create a more relaxed seating position. Still, the Interceptor rides great and feels very relaxed thanks to the plush seat and enormous handle bars which are some of the largest on any ebike I’ve tested. Thirdly, the kickstand has been changed to an adjustable single-side design which is lighter and less intrusive than the older double-sided motorcycle style stand. 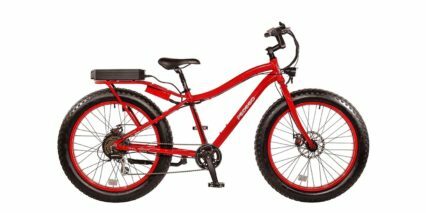 I really didn’t like that kickstand because it seemed to bounce and hang low – also occasionally bumping the tire and pedal arms when riding if not adjusted perfectly. On to the battery! While the Lithium-ion chemistry and 48 volt 10 amp hour capacity remain unchanged, the casing has been improved. As mentioned earlier, it now features a built in light and mini control panel that displays remaining amp hours when pressed. 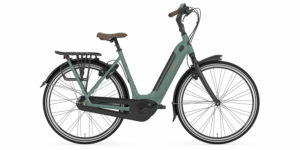 It’s the same battery design used on the City Commuter and it looks rather nice, though removing the pack can be a bit of work – you have to pull pretty hard the first few times to get it loosened up. The biggest improvement in design is that now the metal tubing that makes up the rack actually encloses the battery, protecting it from bumps and scrapes. It also includes a spring loaded metal arm on top for securing minor articles such as a coat or papers. It also positions the weight of the battery lower than the old design (though possibly more extended off the back). I imagine the new design also provides equal or greater structural strength with support arms that extend directly towards the chain stays vs. curving inward. 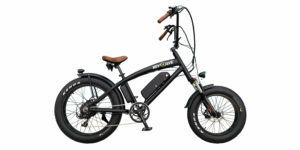 All things considered, this is a winning electric bike that’s comfortable, powerful and fun to ride. 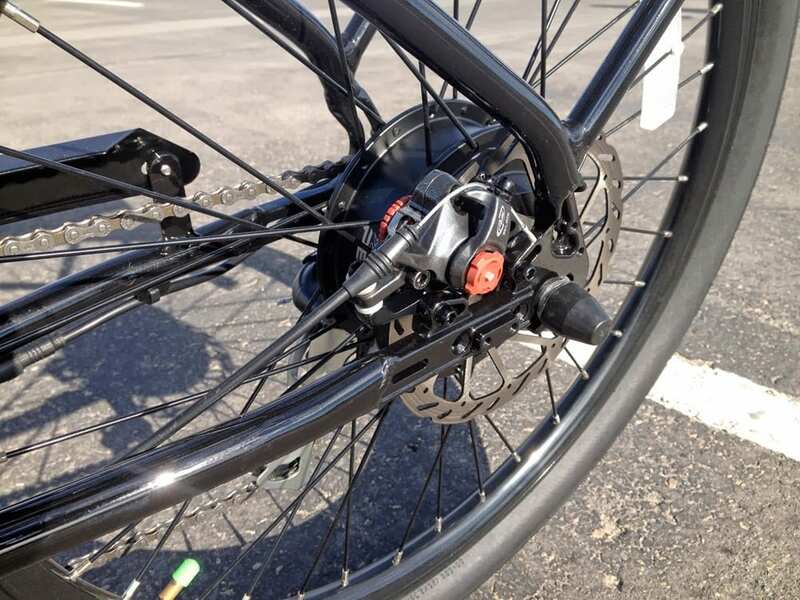 I love the addition of pedal assist and minor design improvements like the addition of water bottle cage mounting points and front and rear disc brakes! 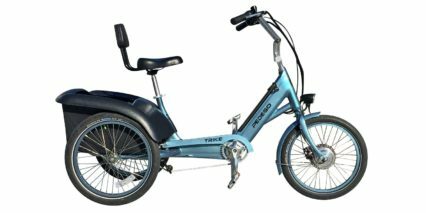 It’s those little improvements that Pedego is known for making along with their dealer network which offer great support. The Interceptor isn’t for everyone, especially because the frame is so large and I believe it only comes in a high step version. 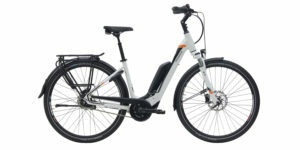 For smaller individuals or those requiring less power there is always the regular Cruiser series or the much smaller 24″ Cruiser which is a very thoughtful offering in the world of ebikes. While the price of the Interceptor has slowly risen, the improvements I’ve seen certainly validate the outlay and I love the optional Kevlar tires, matching fenders and three color options. Court, great review. 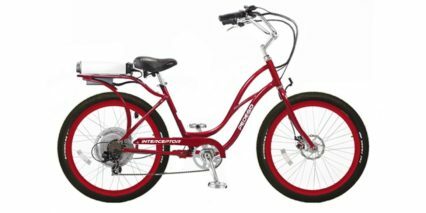 Does the Interceptor have the same “con” that you detailed in the Pedego City Commuter,”Twist throttle does not override pedal assist, can only be used separately”? I was ready to settle on the Commuter but that con made me cross it off the list. Yeah Mark, I believe that’s the case. you are either in pedal assist mode or you switch down to zero and you can use the throttle. 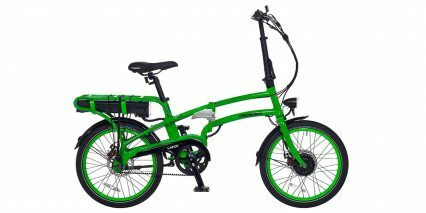 Just tried this bike as I’m in the market for an ebike, have been using this site a lot. My experience with the Interceptor II was that it DID respond to throttle even in pedal assist mode. 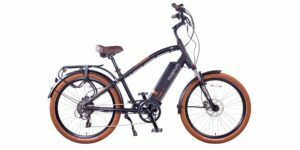 I’m new to ebikes, so this might be misunderstanding your question, but that’s my experience based on what I tried today. Bought a City Commuter yesterday and was expecting having to turn the pedal assist off for the throttle to work. I was positively surprised that the throttle worked in all modes (0-5). 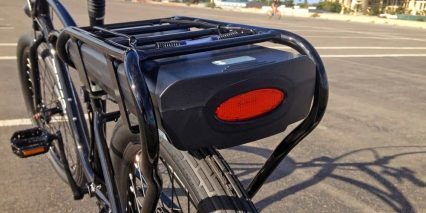 It seems that Pedego also enhanced the battery switch; it now has a clear silicon cover to make it water tight. 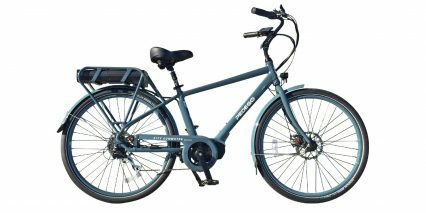 I can confirm Meredith’s observation, albeit not on the “Interceptor”: I have just bought a Pedego City Commuter and it has the same behaviour; the throttle does work in PAS mode. I can leave the bike, let’s say in PAS mode 3, and stop for a traffic light. The throttle allows me then to get the bike started before I start peddling and before the PAS kicks in again. 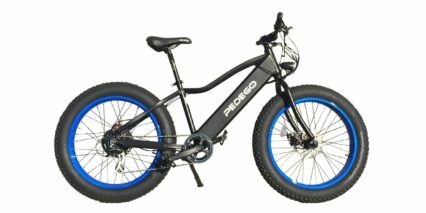 It seems to me that Pedego is continuously improving their bikes. I also noted that the battery on/off switch is modified. It now has a clear silicon cover to make it water-proof. It would seem logical that the “Interceptor” would also display this improved behaviour. Hi, I’ve been riding a 1st generation interceptor for two years. Generally, your review is spot on. It highlights the difference between my bike and the new edition. I have but one quarrel: the pannier bags. I commuted with the pedego bag, the basil, another bag I can’t remember, and ended up with one from ortleib (with a hand towel at the bottom). I needed to carry a battery: 8 lbs of solid, edged weight. I needed to carry my 17″ laptop, not at the same time. The only bomb proof, bullet proof bag turned out to be ortleib. Had it for a year. The basil sent me looking for my laptop on the road one day. The basil actually broke. A linus kept creeping off the rack. The Ortleib has been there a year and takes the bad roads, the speed, all of it. It also mounts right on to the thick tubing in the rack. I live in Southern California, ride 17 miles in, then 17 back 3 or 4 times a week. Weather was not an issue. I do not ride into bad weather on purpose. Actually, the bag came apart at the strap stitching. Somebody found the laptop and told the folks at work, so I got it back. Sometimes the world is a nice place. The 2015 Interceptor was given throttle override when in pedal assist. Also, a new hi-vis color, fluorescent orange replaced the 2014 neon green. Those are the only changes. I bought one. Nice! Thanks for the update, I’m excited to see their new kit at Interbike this Fall. Are you enjoying your so far? What’s the best part and how are you using it? I’m seriously considering the Interceptor II. Do you know, is the geared motor prone to falling apart after awhile? 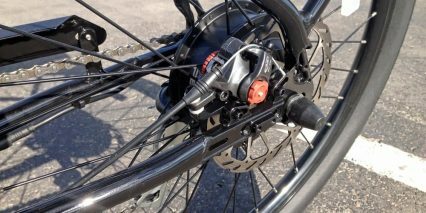 Also, are there other ebikes out there that have pedal assist with direct drive? Hi Adam, the geared motor on this bike is very reliable (and very powerful). 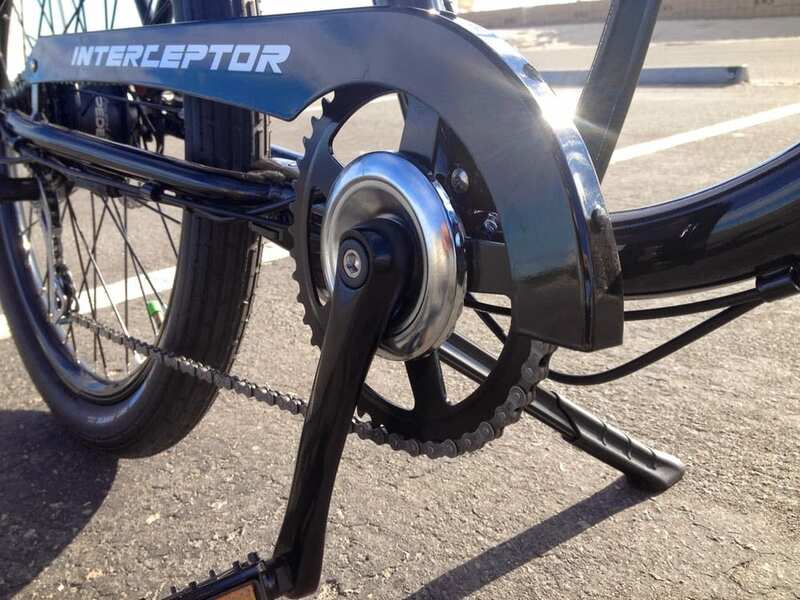 The Interceptor is one of my favorite ebikes from Pedego because it has pedal assist as well as a throttle and the frame is large and strong. 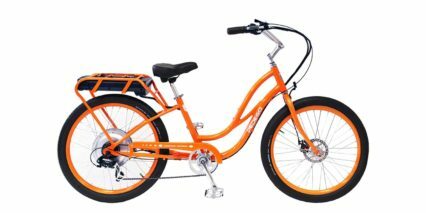 If you’re 6ft or taller and a bit larger this is a great option, I wouldn’t worry about the motor… Pedego has great customer service and offers a solid warranty. 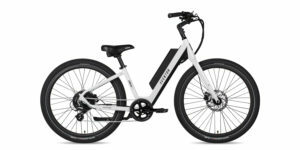 To answer your second question, yes, there are other bikes with pedal assist and direct drive (gearless) motors like the Specialized Turbo, any of the Stromer electric bikes and the Focus ebikes. All of these also offer regenerative braking and regen modes. 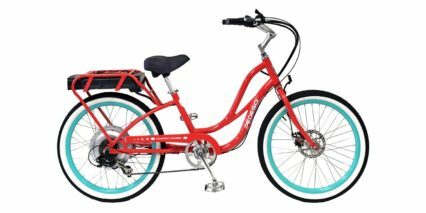 I am trying to decide between the Pedego Interceptor and the Easy Motion Neo City. I’m just shy of 6 feet, 215 pounds. I notice you give a half-point higher rating to the Neo. Just from reading it seems the Neo has a much less powerful motor. Should that be concerning? What earned Neo the extra half-point? Thanks for your site and your help. Thanks Court. What a great help and invaluable resource you have been! The old addage that my home is uphill both ways really does apply in my case here in New Hampshire. The upside is that going from my home is downhill. 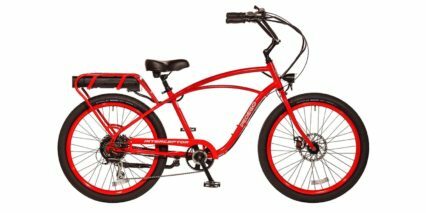 This bike seems perfect for me but I wonder how well it will navigate our dirt roads and the Rail Trail, which is gravel and well maintained. The Rail to Trail project is over 30 miles long and goes from Lebanon, NH to as far South as Concord. It is easy for me to get to but the ride home is killer on my Trex cruiser. 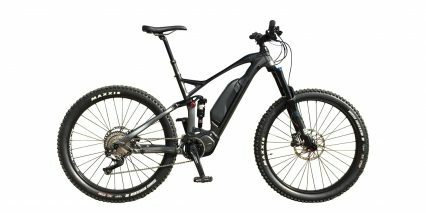 This is why I am considering an Ebike. Can you give me an idea how it will perform going from pavement to well cared for dirt and gravel roads? Hi Bud, great question. I used to ride a Pedego City Commuter to and from work in Austin, TX and half of the ride was on loose gravel. The balloon tires provided some cushion but I eventually bought a seatpost suspension shock like this and finally just sold that bike and got more of a trail setup with large knobby tires for grip and a proper front suspension fork (the Thudbuster seatpost just kept sliding down over time as I bounced up and down). 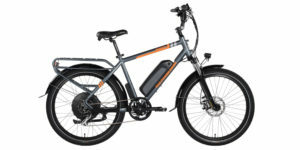 So depending on your budget, weight and height you might consider either a cruiser with suspension like the OHM XU450 or a more aggressive hardtail commuter trail bike like the Volton Alation Mid-Drive. 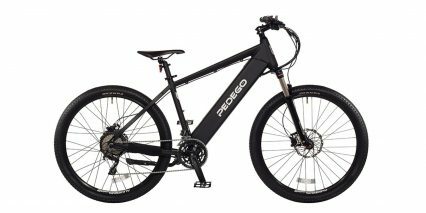 I must say, the Pedego Interceptor is a solid bike with great features, it’s just not ideal for gravel and I personally like suspension for my wrists (I type a lot as you might imagine). Hope this helps! Hi Bud! I think you’ve hit the nail on the head here… Ebikes are slowly emerging in the US but our road systems are much larger and things are spread out. 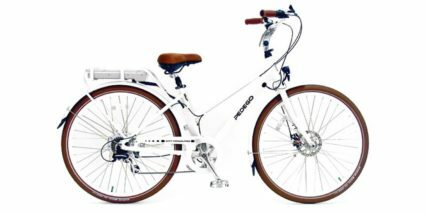 Cars work very well in the US but if you just want to enjoy cycling, climb easier or commute in a city electric bikes can make a lot of sense (did you see this video I shot?). Sorry that you’ve struggled to find a dealer. If you’re looking for some help with specific bikes just reach out and I’ll try to point you in the best direction. Was wondering…it’s been said that the interceptor II is good for big folks. I’m 6’7″ and in the market for a sturdy, strong, reliable cruiser type. Advice? Hi Buzz, I think you’re right on target. The second generation Interceptor comes with a relatively large, sturdy frame. 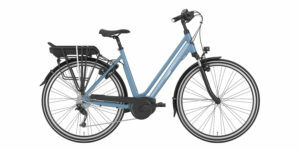 The upsides are many including front and rear lights, pedal assist and throttle, great warranty, nice colors and design elements. The only downside is the rear-heavy layout with battery and motor in the back. 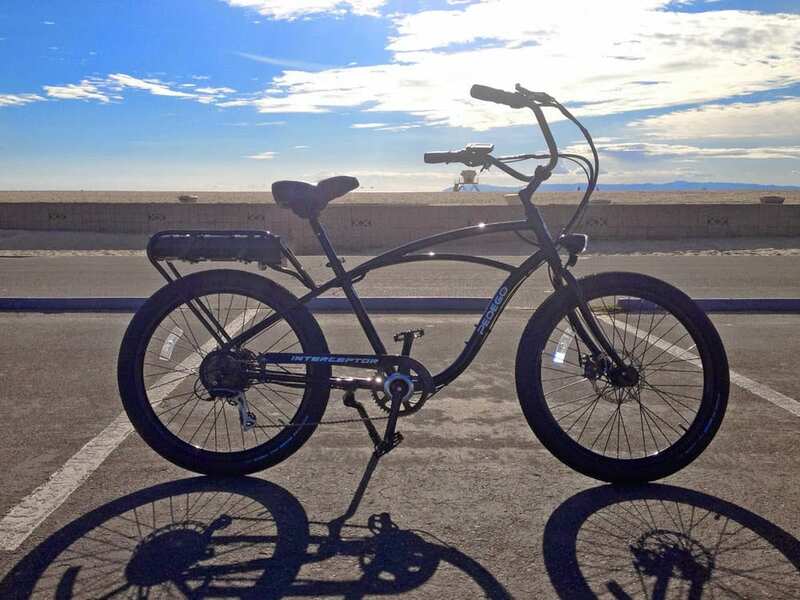 If You’re thinking about purchasing this bike and have more questions (or want to share more details about your intended use) feel free to connect with me using this form. 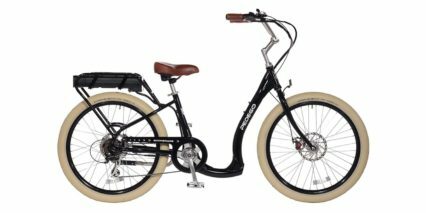 Leaning toward the Volton Alation 500 over Pedego bikes because of its lighter weight and it can go off-road. My only pause is the comment about height/weight. 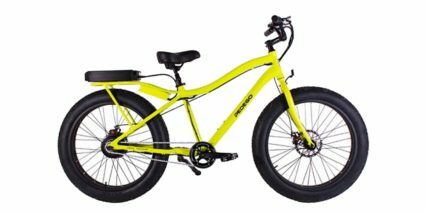 At 6 feet tall 210 pounds, would I feel a power reduction with the Volton versus a bigger, presumably more powerful Pedego bike? Goal is to lose 10-15 pounds on the bike. 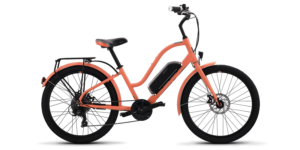 Local dealership has Volton at $2,200 and Pedego priced down 10% to $2,605. Hi Ben! 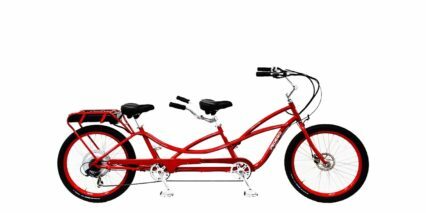 I’m a little behind but all of Pedego’s 2015 models are on my list to review. I’m targeting April. Hi Randy, thanks for the feedback. I’ve learned a lot about range in recent years and acknowledge that not all specs are accurate. As you probably know, it depends on rider weight, terrain and pedal assist level. A good rule of thumb is to divide the watt hours by 20 for a good estimate of throttle only range. So for the Interceptor with a 48 volt 10 amp hour battery (480 watt hours) you might get 20 miles or so. I’ll be reviewing the 2015 Pedegos soon and I’ll focus on accurate range verses copying what the company listed. 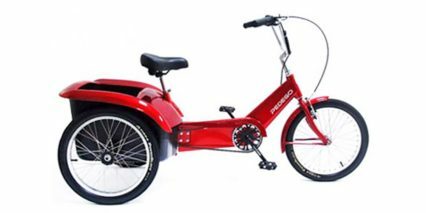 My apologies, I mistakenly thought this was a re-branded Pedego site and I now see it is not. You guys are doing a great job of representing many brands and I’m sure the specs you post are direct from the manufacturers. Please keep up the good work! Love the Interceptor. 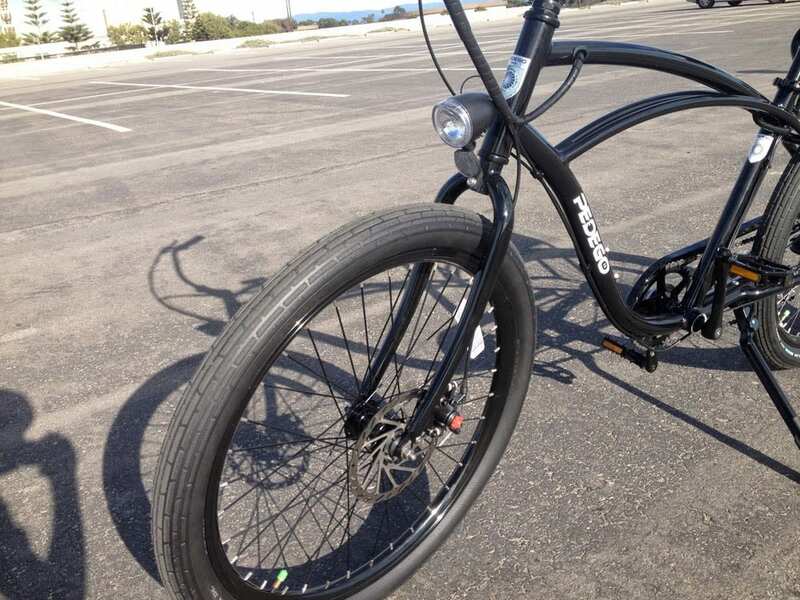 My favorite boardwalk cruiser with it’s handle bar USB port for ITunes and Harley like comfort! 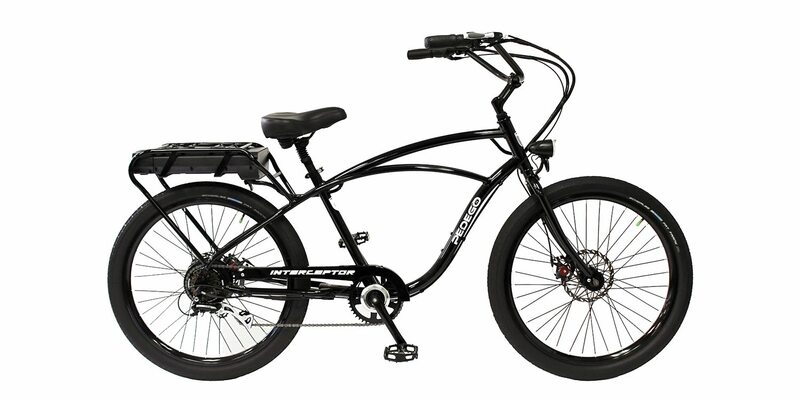 Hi Alex, sorry for the short delay… In my opinion the Pedego Interceptor is one of your best choices. 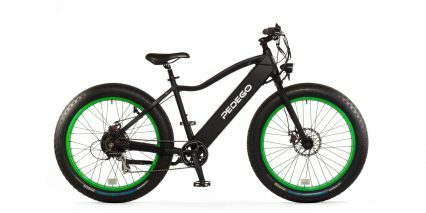 This thing is built well, offers a lot of power and can be setup for you and serviced by a dealer (Pedego has one of the largest dealer networks out there). Do you know if there’s a shop near your house? I feel like you found the best choice on your own so you must have been doing a bit of research to get here, are there other questions I could answer or models you wanted to compare? 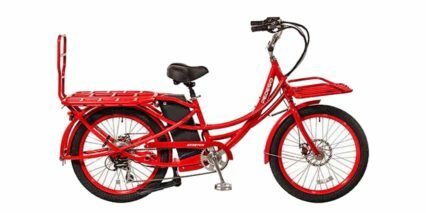 This is a cruiser so pedaling isn’t as efficient as a hybrid but it’s going to be more comfortable given your size, more upright and stable feeling which I feel might be important. 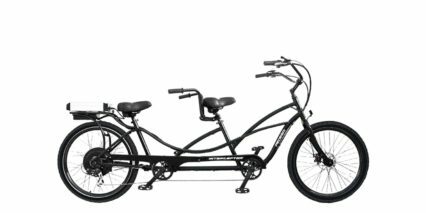 We bought a Pedego interceptor and city commuter at the same time and sorry, but they are garbage. An endless string of problems with many different components. I would STRONGLY recommend NOT buying these bikes. It would take pages to list all the different issues we have had not to mention weeks lost without biking waiting on parts and repairs as well as the times we’ve been stranded with a failed motor. Even given a working motor, I have reservations regarding the design again which would take pages to list. Look for another cruiser. Aww, that makes me sad to read. Sorry about the wasted time, Tom. 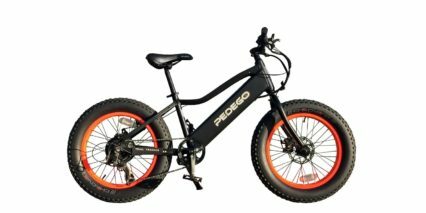 I do my best on these reviews (and Pedego has improved their products ongoing over the years since I first began reviewing) but it sounds like you’ve been through some difficult experiences. I hope your next ebike works better and I appreciate you sharing here. 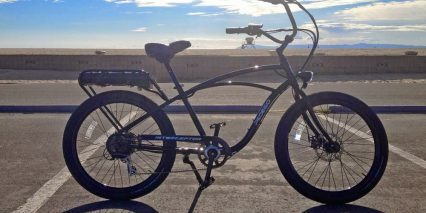 we have 2 pedego bikes, the interceptor and city commuter. both have been disasters. they are poorly built and designed and have been in the shop for repairs probably every other month in the 2 years we have owned them. to list all the problems and design flaws with this bike… well no one would take the time to read it but suffice it to say this is singularly the worst, most breakdown product of any kind i have ever bought in my life. repairs aren’t simple either. you will often get stranded with a heavy bike and no assist far from home or worse in the midst of a multi-day trip hundreds of miles from the nearest dealer. it takes weeks to get parts shipped. Hi Matt, thanks for taking the time to share your experience with the Pedego products. What time period are they from? I know that this company has been responsive with a battery recall and has one of the largest network of dealers. Some of their hardware is simple compared to new integrated batteries and motors but I have seen them improving and supporting customers. I’m sorry that your experience has been so rough.